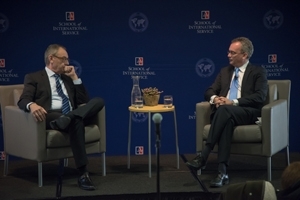 David O'Sullivan, Ambassador of the European Union (EU) to the United States, visited the School of International Service (SIS) in February for a discussion with Dean James Goldgeier about the 2016 transatlantic agenda and the critical issues facing Europe—including the refugee migration crisis, Brexit, Russia, and the Transatlantic Trade and Investment Partnership (TTIP) negotiations. To begin the discussion, Ambassador O’Sullivan asserted that rumors of the death of the EU—to paraphrase Mark Twain—are greatly exaggerated. One of the greatest challenges Europe is facing is the Syrian refugee crisis. Approximately 1.5 million displaced Syrians have fled to Europe in the past eighteen months, an influx that Europe is struggling to manage even as the numbers continue to climb. To handle the crisis, O’Sullivan stated that Europe needs to better manage external borders; to create reception centers equipped to manage and look after large numbers of refugees seeking asylum; and, ideally, to reduce the burden on individual countries. Another challenge is for Europe to maintain its international sanctions against Russia in the face of continued strife in Ukraine. Given that several European countries have strong business ties with Russia, Dean Goldgeier asked the ambassador how long Europe can afford to continue its sanctions. Regarding “Brexit” —the possibility of the United Kingdom leaving the EU—O’Sullivan was “cautiously optimistic” that Prime Minister David Cameron and the EU could negotiate a solution. Despite the challenges Europe is facing—both outside of and within Europe—the ambassador stressed that the EU will prevail. Watch the video of the discussion. Learn more about upcoming events at SIS.